Michelle O’Rourke is a registered nurse with an extensive background in Emergency Nursing, Parish Nursing, and Hospice Palliative Care. She also obtained a Master of Arts in Pastoral Ministry from Assumption University, (Windsor Ontario), enjoying fourteen years as a Lay Pastoral Minister and two years as the Lay Ecclesial Ministry Specialist with the Roman Catholic Diocese of London. During that time Michelle helped to develop a national education program for training Parish Nurses. Thesis work for her graduate degree reflected her interest in spirituality and palliative care and was subsequently published. 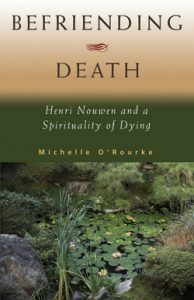 Befriending Death: Henri Nouwen and a Spirituality of Dying has sold over 5,000 copies worldwide. 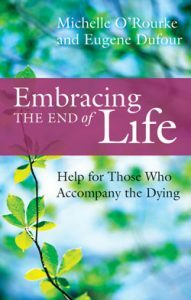 Studying Henri’s life and writings impacted her deeply, both personally and professionally, which led to her second book, Embracing the End of Life: Help for Those Who Accompany the Dying, co-authored by Eugene Dufour. In 2014 Michelle was chosen to oversee the design and development of Chatham-Kent Hospice, a ten-bed residential hospice which opened in April 2016. 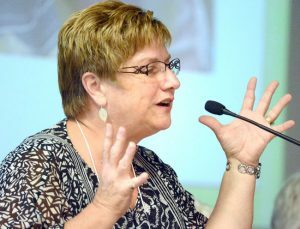 She continued to serve in a shared role as the Program Coordinator for both the Chatham-Kent Hospice and the Palliative Care and Oncology Departments at the Chatham-Kent Health Alliance until her retirement December of 2017. She now has more time in her ‘semi-retirement’ to focus on what she truly enjoys – speaking, writing, consulting and self-care! Her areas of focus include palliative care, grief, spirituality and caregiving. Michelle is the mother of four, and she and her husband Tom live in London and enjoy travelling and spending time with family and friends. She is currently offering support to St. Joseph Hospice in London and is excited to be working with ROA Architecture on new hospice building projects, and with the Henri Nouwen Society on their new Courage for Caregiver materials.